Memory Protection Devices introduces part number BH123A, an ultra low profile battery holder for “123A” batteries. Since the battery is flush with the pcb’s surface, it adds no height to a CR123A cell when mounted on a printed circuit board. Use multiple holders, wired thru the pcb for serial or parallel connectivity options. The battery holder is made of premium materials like stainless steel and polypropylene. It’s plastic body offers high heat resistance, good stiffness and easy battery exchanges while firmly keeping the battery cell in place. Stainless steel contacts offer a great balance of mechanical characteristics. It is a widely used material and has excellent corrosion resistance, high strength and ductility, plus resists oxidation at high temperatures. It is nickel plated overall for mating with nickel plated contacts on lithium cells. • The holders performance exceeds thermal, shock and vibration testing as outlined in EIA-364. • Light weight at 2.75 grams (without battery). • Reach & RoHS compliant, containing less than 0.1% of the SVHCs and DBP, BBP, DEHP, DIEP, PFOA, PFOS and Halogen free. • Rugged enough for typical applications, passes 1 meter drop testing. • PP is rated @ Vicat softening temperature of 155ºC per ISO 306. • PP is FDA approved for repeated food contact per 21 CFR 177.1520. • Wave soldering is quick & reliable with 2 wide blade pc pins. 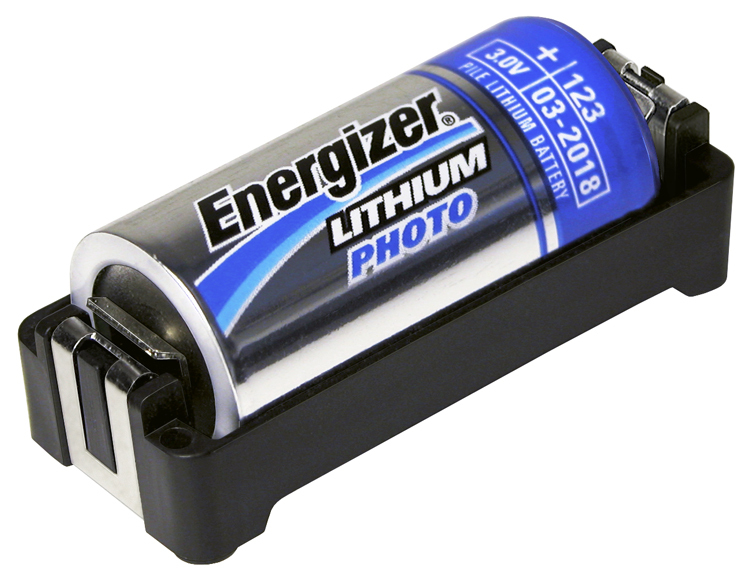 The holder accepts batteries from alkaline and lithium to lithium-Ion.